This well presented dormer bungalow is offered for sale in an exclusive development situated in the township of Gretna. The accommodation comprises of a spacious entrance hall, lounge open to modern dining kitchen with French doors leading to the enclosed rear garden, separate Utility Room with generous storage. Master Bedroom with range of fitted furniture and an En Suite Shower Room. Further Bedroom and WC. On the upper floor there are two generous eaves Bedrooms, one with an En Suite Shower Room and separate Bathroom. 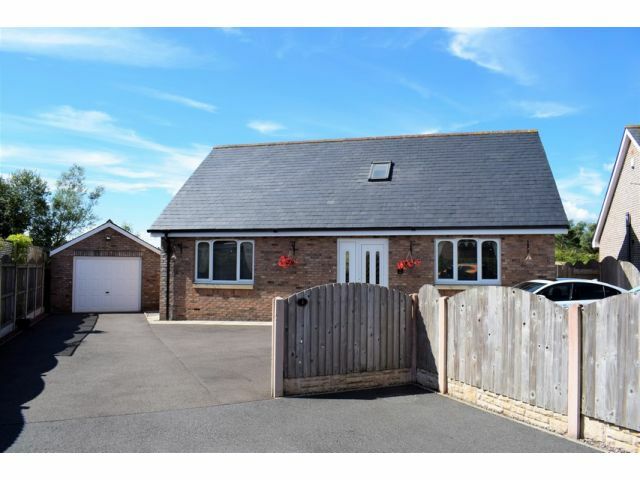 To the outside there is an extensive driveway to the front leading to the detached garage and an enclosed rear garden with lawn and decking sections and open country views. Recessed lighting, storage cupboard. Radiator, feature tiled flooring, stairs to upper floor. Window to rear with blinds. Recessed lighting, generous range of modern wall and base units. Feature unit with integral eye level double oven and storage, four plate ceramic hob with extractor fan. Stainless steel sink and drainer with mixer tap, integral dishwasher. Breakfast bar. radiator, tiled flooring. Tiled flooring, radiator, French leading to decking. One x two spotlights, generous walk in airing cupboard, extractor fan. Sink and drainer, plumbing for washing machine. Door to garden. Opaque window to rear with blinds. One x three spotlights, extractor fan. Toilet and wash hand basin. Heated towel rail, tiled flooring. Window to front with blinds. Ceiling light, generous range of modern fitted bedroom furniture, storage cupboard. Carpeted flooring. One x two spotlights, extractor fan. Three piece suite comprising of toilet, wash hand basin and shower cubicle with mains fed shower. Heated towel rail, tiled flooring. Window to rear with blinds. One x three spotlights, built in wardrobe. Radiator, carpeted flooring. Recessed lighting, loft access, smoke alarm. Carpeted flooring. Window to side with blinds and Velux window. Ceiling light, radiator, carpeted flooring. Velux window. One x two spotlights, extractor fan. Partially tiled. Three piece suite comprising of toilet, wash hand basin set into vanity unit and shower cubicle with mains fed shower. Heated towel rail, vinyl flooring. Partially tiled. Velux window. One x two spotlights, extractor fan, three piece suite comprising of toilet, wash hand basin and bath. Heated towel rail, vinyl flooring. Window to side and Velux window. Ceiling light, two radiators, carpeted flooring. Access from Loanwath Road. Private shared lane leading to tarmac driveway with parking to front for numerous cars. Detached garage with front and rear access.. Enclosed rear garden with decking and patio areas, lawn area and drying area with rotary clothes drier. Open views to rear. There is an open burn that runs at the rear of the property. Out of office hours (before 9pm) – 07742537220.